There are plenty of horses at big prices in the Grand National as we look at a selection of Grand National horses to back each way. With the 40 runners likely to go to post in the Grand National – it certainly pays to be greedy with your selections for the world’s most prestigious National Hunt steeplechase. Narrowing down your selection’s to just one horse is a pastime not really relevant for punting on the Grand National as punters should have at least two horses onside to increase the chances of having one involved in the finish. Each way betting is thought of in some punting quarters as mugs way of gambling as the odds are usually stacked in favour of the bookmaker. And this is arguably the case when betting on horses that are at the head of the betting. The each-way returns are hardly worth the bother when backing a 12/1 shot in a race like the Grand National as the risk to reward isn’t really great enough to make it worthwhile. However, in the Grand National when applied with logic and good financial management, punting each-way is a great tool to beat the bookmakers with – if targeting horses that are above the 16-18/1 mark in the market. We have targeted two each-way horses within that price range for this year’s Grand National. Bookmakers are expecting to see millions of pounds turned over throughout the country and although they are likely to make huge profits on the day, we feel following our each way selections could reap the benefits and take the greedy so and so’s for a few quid. Our best each-way punt lies in the chances of Imperial Commander, who can be backed at 20/1 with Bet365. This old fella will be very popular within the punting population due to his past achievements in the world of National Hunt racing. 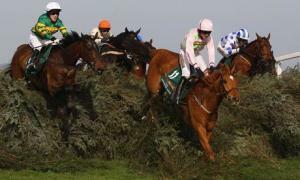 He is probably only one of a few horses in this year’s Grand National that is known outside racing circles due to his win in the 2010 Cheltenham Gold Cup, where he beat both Kauto Star and Denman to give his trainer Nigel Twiston-Davies his first ever win in the Cheltenham Festival feature. Over the years the Grand National, due to the bumper prize money, has the ability to attract a higher standard of horse to the race. Compared to a few years ago, the race now can be won by classier horses, higher in the weights, as shown by last year’s winner Neptune Collonges, who had won some big Grade One chases over the years. Imperial Commander has had his fair share of problems in recent years with injuries but his mark has dropped to one which makes him a realistic Grand National prospect. He’s a superb jumper of fences and as long as he stays out of trouble you would fancy his chances of getting round Aintree safely. At 20/1 he’s a big each-way player. Keeping along the same classy chaser lines, we feel that Paul Nicholls’ charge What A Friend, who is part-owned by Sir Alex Ferguson, looks a decent each-way prospect too at 50/1 with Paddy Power. This is a horse that has finished second to Denman in the Hennessy and won a Lexus Chase at Leopardstown and the Aintree Bowl, so certainly has the class to make a play for the National prize.